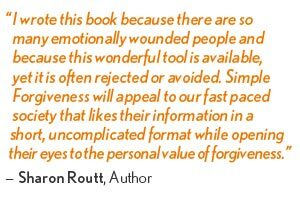 Simple Forgiveness differs from other books on forgiveness because it is concise and easy to read, encourages readers to pick it up and take a quick look at a subject many are reluctant to face. In 60 pages the reader will be confronted with the misbeliefs about forgiveness, shown the benefits of forgiveness, the consequences of unforgiveness and learn in four steps how to forgive. The emphasis is on why forgiveness empowers and frees the one who forgives. This book is perfect for giving to those you know who need to forgive. It is short, inexpensive, easy to read and provides the truth they need to hear. So order one for yourself and get at least one extra copy to give away.